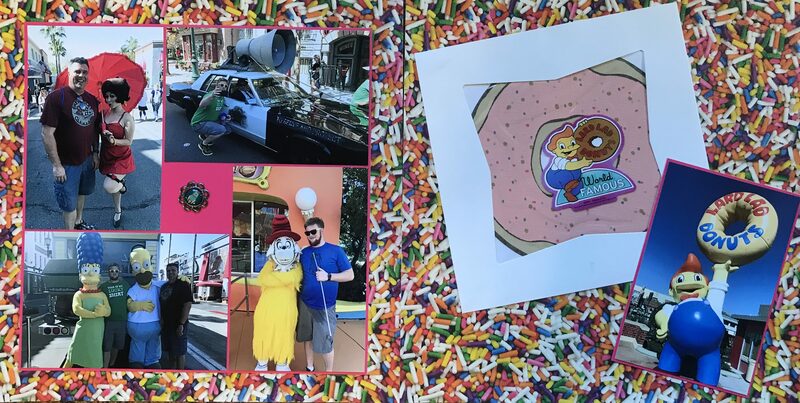 This spread showcases characters that we got our picture with as well as Lard Lad Donuts. I used a candy background paper for this spread to highlight the sugar from the donuts, and the cartoon nature of the characters. The pictures are bordered in pink to help them stand out against the busy background. At Lard Lad Donuts you can buy donuts that are 7 or 8 inches in diameter and they come in a box like a cake. My son and I bought a doughnut, which we shared, and I kept the box. For this spread I cut the lid off of the box, and then used my Cricut machine to cut out a doughnut to put under the plastic from the lid so that it would look like there was a doughnut in the box.